Mouse anti Human C3a receptor antibody, clone hC3aRZ1 used for flow cytometry. Expression of C3aR1 and C5aR on collagen- and convulxin-activated platelets. Washed platelets were activated for 10 min with 2.5 µg/mL collagen, 500 ng/mL convulxin or saline and further incubated for 30 min at RT and analyzed for C3aR1 and C5aR expression by flow cytometry. A: representative overlays of fluorescence histograms obtained for each condition using an alexa fluor 488 anti-C3aR1 (solid line), a FITC anti-CD88 (dashed line) or a FITC control IgG (dotted line). B: Mean fluorescence intensities ± SEM of 3 to 9 experiments for each condition. Requirements for Membrane Attack Complex Formation and Anaphylatoxins Binding to Collagen-Activated Platelets. Mouse anti Human C3a Receptor antibody, clone hC3aRZ1 recognizes the receptor for human complement component C3a (C3aR), a ~55 kDa cell surface protein of the rhodopsin family of G protein-coupled seven-transmembrane receptors. C3a is an anaphylatoxin, which is a potent proinflammatory mediator that possesses immunoregulatory properties. C3a regulates inflammatory functions by binding to the C3a receptor. C3aR is expressed on various tissues and leucocytes including basophils, neutrophils, mast cells, eosinophils and activated T lymphocytes. Expression levels of C3aR on human cells varies significantly between donors. Cells from immunised BALB/c mice were fused with cells of the X63-Ag8.653 myeloma cell line. Use 10ul of the sugested working dilution to label 1x106 cells in 100ul. Werfel, T. et al. (2000) Activated human T lymphocytes express a functional C3a receptor. J Immunol. 165 (11): 6599-605. Soruri, A. et al. (2003) IL-4 down-regulates anaphylatoxin receptors in monocytes and dendritic cells and impairs anaphylatoxin-induced migration in vivo. J Immunol. 170 (6): 3306-14. Zwirner, J. et al. (1999) Evaluation of C3a receptor expression on human leucocytes by the use of novel monoclonal antibodies. Kacani, L. et al. (2001) C5a and C5a(desArg) enhance the susceptibility of monocyte-derived macrophages to HIV infection. Raby, A.C. et al. (2009) Soluble TLR2 reduces inflammation without compromising bacterial clearance by disrupting TLR2 triggering. Martel, C. et al. 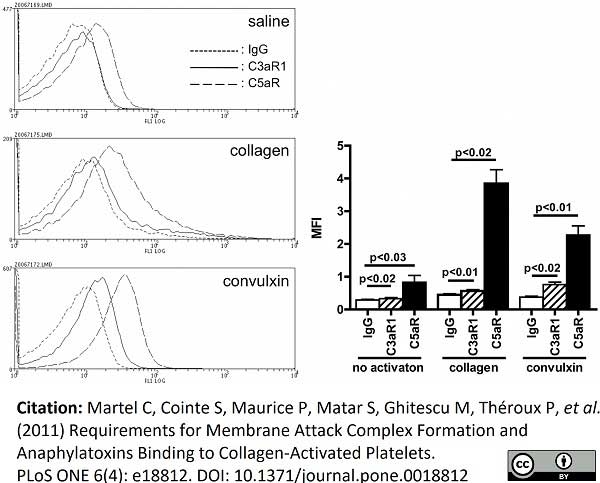 (2011) Requirements for membrane attack complex formation and anaphylatoxins binding to collagen-activated platelets. Hengartner, N.E. et al. (2015) Crucial Role of IL1beta and C3a in the In Vitro-Response of Multipotent Mesenchymal Stromal Cells to Inflammatory Mediators of Polytrauma. Török K (2012) Human T cell derived, cell-bound complement iC3b is integrally involved in T cell activation. Patzelt, J. et al. (2015) Expression of anaphylatoxin receptors on platelets in patients with coronary heart disease. J Immunol. 183 (1): 506-17.